The Door to Hell is a real place. It's not located in your ex-boyfriend's apartment building; it's in Turkmenistan. The name isn't literal, of course, but one look at this giant, burning desert crater of flames might have you second-guessing. Haunted houses and creepy basements are one thing, but the scare factor is taken to a new level near the village of Derweze in the middle of the Karakum Desert. 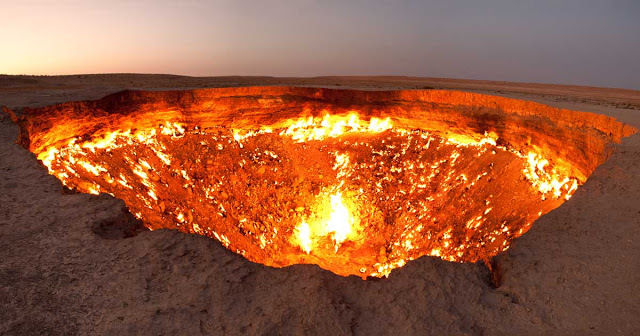 The Darvaza gas crater, aptly nicknamed by locals "The Door to Hell" or "The Gates of Hell," is a burning crater that stretches 230 feet across and reaches 65 feet deep. Satan's swimming pool has been engulfed in flames since 1971. Here's the story: Back in the early '70s when Turkmenistan was part of the Soviet Union, some Soviet geologists trekked out into the Karakum in search of oil. They started drilling, and that's when things went south. Unbeknownst to them, the team and their equipment were sitting atop a huge underground pocket of natural gas. The weight crumbled the desert surface, opening up a few craters that expelled all that flammable vapor. If you've ever had a gas leak scare in your apartment, you know the risk of fiery disaster is just one flick of a Zippo away. To deal with the gas spewing out of the Earth, the geologists implemented an idea that is not uncommon for the job, but sounds a little wild: They lit that stuff on fire. (Disclaimer: This is not the way to handle that apartment gas leak!) The hope was that all the escaped natural gas would burn up in a few weeks. It didn't. Fast forward more than 40 years, and you can still roast up a good s'more over the pit. There are no plans on how, when, or if the burning will be ended.